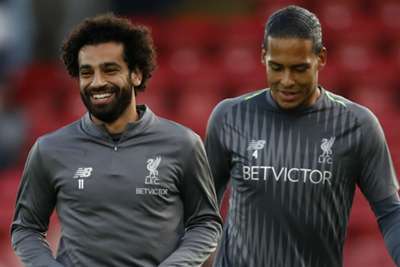 Liverpool have received a major fitness boost with Mohamed Salah and Virgil van Dijk involved in training ahead of Saturday's trip to Huddersfield Town. The star pair have overcome respective muscle and rib complaints to give Jurgen Klopp some welcome relief from the injury headaches that mounted over the international break. Sadio Mane underwent hand surgery on Wednesday and appears likely to join Naby Keita on the sidelines, the midfielder having hurt his hamstring playing for Guinea. Neither player took part in Thursday's session at Melwood, although James Milner did return to the track almost two weeks on from hobbling off in the scoreless draw with Manchester City. "We will try really hard [to have] everybody available at the weekend," Klopp told the club website. "We will probably fail with one or two but we will try everything [to get them] on the pitch or available at least. Until then, you have to wait." Adam Lallana, last included in a matchday squad at the start of September, is in contention to feature against the struggling Terriers after shaking off a groin injury. Klopp stressed a cautious approach would be taken with the fragile England attacker. "Now it's getting a bit difficult with judging how fit he is really," the Reds boss said. "But training looks tremendous. He obviously enjoys playing football. It's easy to enjoy watching [him]. "We will see what we do. Nobody, not even he, knows how long he can [play] and stuff like that."